Though our famed celebration is celebrated August 24 & 25, August 25th is the actual recognized feast day of the parish’s patron saint, King Louis IX of France. A life-size statue of the "lieutenant of God on Earth" is displayed on the church grounds. Long before 10 a.m. on St. Louis Day, things are buzzing on the Koenig Park grounds. 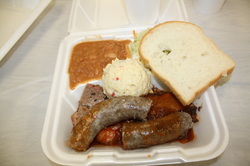 The highlight of every celebration is the serving of the giant barbecue dinner — beef brisket, Alsatian-style sausage, potato salad, beans, fresh bread and iced tea. 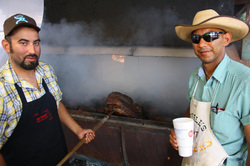 After the huge metal barbecue pits have been fed an adequate supply of mesquite coals, a virtual mountain of prime, boneless beef is placed in the pits and cooked to perfection by some 50 volunteers. Only cured mesquite wood from area farms and ranches is used to slow cook the thousands of pounds of barbecued brisket each year. 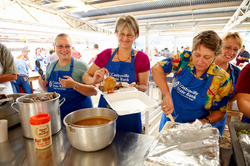 Tons of potato salad, coleslaw, huge vats of pinto beans, thousands of slices of Alsatian bread and homemade cake, and a sea of iced tea and coffee, round out the menu that more than 500 volunteer workers will dish out at a pace of around 2,000 hungry diners per hour. An incredibly efficient serving area avoids long meal lines. Diners may feast under the roof of the large dining pavilion or they may avail themselves of heaping plates to go, and eat their meals under the Biergarten Tent while enjoying the musical performances. Some prefer picnic style, beneath ancient pecan trees that have shaded picnickers for over a century. Wash and clean beans; put in kettle and fill water 4 inches over top of beans. Heat to boiling and add all remaining ingredients. Cook slow until the bubbles that come up have a bubble inside. Turn off heat and let set to thicken. The Groff clan, pictured above, have been the "Frijole Kings" for over 30 years. Mix salt, pepper and garlic powder and sprinkle on both sides of brisket. Cook over hot mesquite coals for hours and hours and hours. Mix basting sauce ingredients and boil in large pot for 10 minutes. Baste meat throughout cook time. Many years ago, a local contest yielded the original recipe for the St. Louis Day BBQ Sauce. Over time, it’s been perfected. Residents brag that it’s “Number one” in Castroville and the surrounding area. Pictured are L-R Troy Haby and Nathan Lutz, the two men who have been concocting and guarding the sacred recipe for over 30 years. Tip #7: You would be wasting your time trying to get the secret from them; they don't even fly on the same plane together. These two men and one other Secret Sauce Society member are the only ones who know how to formulate the secret ingredient.